This galette gets high marks from rhubarb lovers when served warm with ice cream. What’s a galette? A rustic, free-form pie made with a sturdy, yet tender dough that does double-duty, working as both a crust and a container, so no pie pan is required. It makes a more causal impression than most pies and is quicker and easier to make. 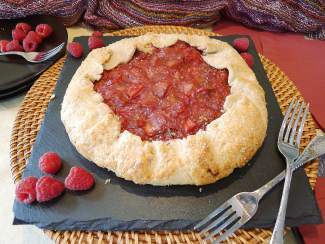 This one features my go-to galette dough and an appealing mixture of fresh rhubarb and raspberries. It gets high marks from rhubarb lovers when served warm with ice cream. If your rhubarb stalks are an inch or more wide, halve them horizontally before cutting vertically into ½-inch pieces. At our altitude, the rhubarb must be in small segments to be thoroughly baked when the rest of the galette is done. If you use frozen rhubarb, thaw and drain it before proceeding with the recipe or the filling may be runny. Though not essential, dusting the dough with ground graham crackers before adding the filling prevents the bottom of the crust from getting soggy while baking. 1. Make dough (can be made one day ahead): Combine the flours, sugar, and salt in the bowl of a food processor and pulse until blended. Cut the butter into 9 pieces, add them and pulse until they’re broken up but still in chunks. Add 5 tablespoons ice water and pulse until mixture forms coarse crumbs. Squeeze some between your fingers; if it doesn’t hold together, add more water, a little at a time, pulsing after each addition, until it does. Dump out and gently knead a few times until a cohesive dough forms (handle the dough as little as possible), shape into a 6-inch disc, wrap, and refrigerate for at least 40 minutes. 2. Make filling: Place 3 tablespoons cold water in a small bowl or 1-cup measure, add the cornstarch, sprinkling a little in at a time and stirring until dissolved before adding more. If the mixture gets too thick to easily blend in the cornstarch, add a little more cold water. In a large saucepan, combine the rhubarb pieces, raspberries and sugar. Cook over low-medium heat, stirring with a wooden spoon or silicone spatula, until juices are released and sugar dissolves, about 4 minutes. Keep stirring, add the cornstarch mixture, and bring to a boil (keep heat as low as possible to get to boiling) until thickened. Remove from heat (the rhubarb will have softened but not be thoroughly cooked), taste, and stir in more sugar if desired. Scrape the filling into a bowl, cover and refrigerate until room temperature. Preheat the oven to 400 degrees with a rack in the center position. 3. Dust a sheet of parchment paper with a little flour, place the dough disc on it (let soften if too cold to roll easily) and roll to a rough 12 ½ -inch circle. Slide the parchment paper, with the dough on it, onto a cookie sheet. If using ground graham crackers, sprinkle them on the dough, leaving a 1 ½ to 2-inch border all around. Spoon the cooled filling onto the ground crackers (or the dough), mounding it slightly in the center and leaving a 1 ½ -2-inch border. Fold the edges of the dough over the filling, pleating it as needed. Brush the dough with the beaten egg (you won’t use it all) and sprinkle with coarse sugar. 4. Place in the oven and immediately reduce the temperature to 375 degrees. Bake until the crust is set and lightly golden and the fruit filling is hot and softened, about 45-55 minutes. Remove and, for ease in cutting, cool completely before slicing with a thin bladed, sharp knife. Reheat slices in a 325 degree oven or in a microwave until warm to the touch. Top with vanilla ice cream, if desired. Store leftovers, covered, in the refrigerator.